Delivering a crisp, flavourful, perfect batter every time. 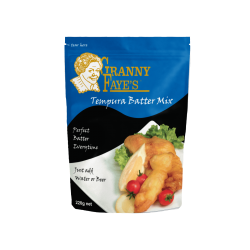 Granny Faye’s Batter Mix is created simply by adding water or beer to the product and applying to the desired food. This batter mix is the ideal complement to use on fish, meat, chicken and vegetables creating flavour, colour and crunch to the dish.